Rembrandt wrote old men almost with the greatest pleasure. The life lived seemed to him to be something that leaves an indelible mark on a person, which, with a certain talent, can be read like from an open book. He wrote both young people and children, but old men were always the best models for him. “Portrait of an old woman” – his next appeal to his favorite topic. The woman depicted on it is impossibly old. She has a wrinkled face, dark eyes, clothes wore more to the widow than to a married woman. A black shawl, a brown blouse, a black hat – the old woman crossed her arms on her lap, she herself sits deeply drowned in a chair, from which only smooth wooden armrests are in the picture. Her skin is similar in color to the tree. Hands are knotted, perekorezhny arthritis and hard work, they are the veins. She looks a little to the side, and her gaze is very characteristic of old people – there is no interest, no joy in it, only fatigue and readiness to go beyond the death line when the time comes, not feeling fear and not asking for a delay. The traces that life has left on her face speak of a long and difficult century. She suffered a lot, a lot and was glad. She went through many years, raised children, nursed her grandchildren, and all this can be seen in her, in her face, in her eyes. 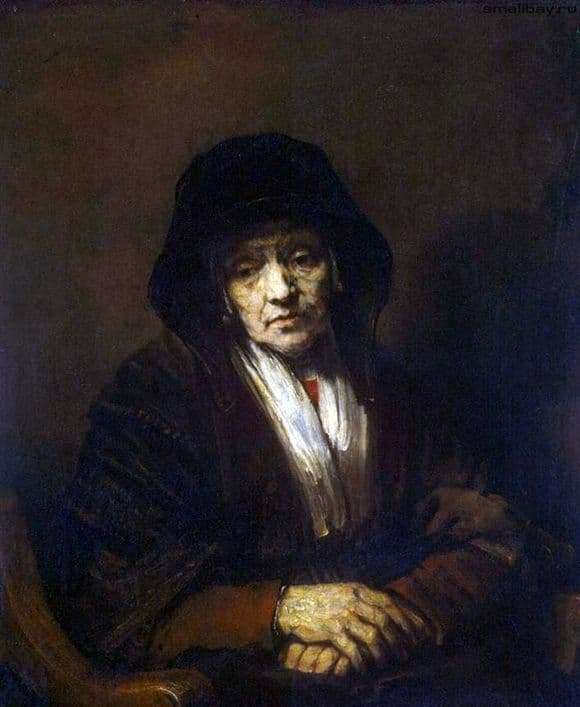 Rembrandt was not afraid to portray old age as it is. At all times, youth was praised, its proud beauty, its strength and aspiration forward. Rembrandt saw the charm of old age. She did not seem to him either disgusting or terrible. On the contrary, for him she was no reason not to love a man. Each of us goes to old age, each comes to her sooner or later. The back will bend, the skin will dry, every year will leave marks on the face. But the old woman from the portrait, and his other old people, as it were, speak from portraits – that is not a problem. This will happen to everyone, and even in old age you can maintain a calm dignity.